It will be five years on the first of August since the Interstate 35-W bridge in Minneapolis, Minnesota fatally failed leaving 13 dead and dozens injured. If any cloud truly has a silver lining, the sterling behind this tragedy may be the momentum it has provided in helping to assure that hundreds of bridges across the U.S. are safe. An investigation conducted by the National Transportation Safety Board (NTSB), determined that gusset plates were the “immediate culprit” behind the 2007 collapse in Minneapolis, according to Federal Highway Administration (FHWA) engineer Justin Ocel. Together with the FHWA and the American Association of State Highway and Transportation Officials (AASHTO), engineer Mark Iadicola of the National Institute of Standards and Technology (NIST) is therefore working to understand and document the failure of gusset plates with the help of digital image correlation. The FHWA and AASHTO are now working together to incorporate what they’ve learned into the AASHTO Bridge Design Specification and the Manual for Bridge Evaluation, which are used in bridge design and rating across the U.S.
© Tony Leininger and IT for Good 2012. See sidebar for full copyright notice. Biomedical engineering researchers at the Public University of Navarre (UPNA) are developing a more affordable, more widely usable eye tracking device. Such devices note where people are looking, and the technology has been used primarily to help people with disabilities (to interact with a computer cursor, for example) and to perform market research (to learn what consumers find attractive). New possibilities for using eye tracking include incorporating the technology into videogames or driving. For example, drivers whose eyes were not focused forward for a specified period might be alerted by eye-tracking software to pay attention to the road. How is technology changing your life for the better? Parents of children with asthma can find it challenging to comply with medical treatment guidelines. However, the results of a new study from Seattle Children’s Research Institute show that online tools can help. In the study, parents used an interactive web site called “My Child’s Asthma” to help them keep track of their child’s medication usage. The researchers found that with the help of the web site, parents’ compliance with asthma controller medication usage guidelines improved. Goals for the site included increasing positive beliefs about asthma management, optimizing care by increasing provider-prescribed controllers for children with persistent asthma, and promoting controller compliance among children on controllers. The study was supported by a grant from the National Heart, Lung and Blood Institute, National Institutes of Health. For adults in North America, heart failure is the most common cause of hospitalization. Studies have shown that while around 40% of heart failure patients with cardiac symptoms may safely return home from a visit to an emergency department, one of every 11 patients who are discharged dies the following week. To improve patients’ odds of survival, Dr. Lee and other cardiologists at Canada’s Peter Munk Cardiac Centre are developing smartphone and web-based applications that can help emergency department physicians determine patients’ risks in real time. Their solution, funded by the Canadian Institutes of Health Research (CIHR), is an algorithm, “Emergency Heart Failure Mortality Risk Grade” (EHMRG), which uses 10 simple indicators of potential heart trouble. The EHMRG risk model provides a diagnostic tool that emergency physicians, consulting cardiologists, or general internists can use to help them decide if the patient’s short-term risk of death warrants continued time in hospital. Future plans include web and smartphone applications for seamless integration in the field, including in developing countries. According to People for the Ethical Treatment of Animals (PETA), the Food and Drug Administration’s “Draft Guidance for Industry: Modified Risk Tobacco Product Applications,” will lead to animal studies being conducted if approved as currently written. The group has therefore called on the FDA to change its guidance. Instead, PETA recommends FDA call for the use of “only modern, effective non-animal testing methods.” These include computer simulation, tests that use human cells, and clinical studies conducted with human smokers. The methods PETA recommends for avoiding animal testing are currently in use in Canada and are widely available. Several countries, including Belgium, Germany, and the U.K., have banned animal testing of tobacco products. Next summer, astronauts on the space station will attempt to operate a NASA K10 robot located on Earth. 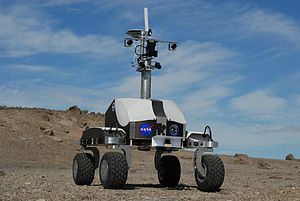 To carry out this engineering test, NASA is working with Industrial Design students at the Academy of Art University to create the robot’s user interface (UI). The design students regularly interacted with NASA engineers from NASA’s Ames Research Center during the last semester. In future space missions, the students’ work could help astronauts remotely control robots on the moon or other planets. Since 2002, four public-private partnerships have been working together under the collective name of Research4Life to help people in the developing world gain access to vital scientific research. In May, the partners announced that the content available has increased significantly since 2011. The number of items available has reached 17,000, which includes peer reviewed scientific journals, books, and databases. To help achieve the UN’s Millennium Development Goals through access to critical scientific research, Research4Life is providing researchers at over 6,000 institutions in more than 100 developing countries and territories access to peer-reviewed scientific research. The material is provided by some of the world’s leading science publishers for free or at a low cost online.